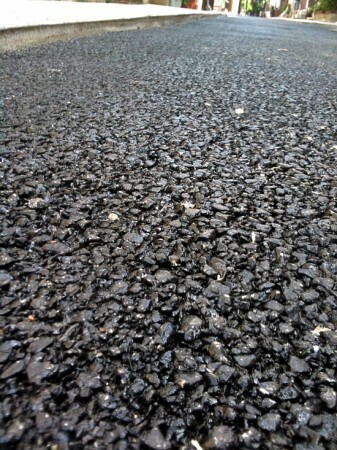 Today, the City of Philadelphia unveils its first street paved with porous asphalt. It may only be a tiny Bella Vista alley that rarely sees auto traffic, but it’s one of hundreds of such side streets, and it marks a milestone in part of a larger plan. As one of America’s first cities, Philadelphia is home to one of the nation’s oldest sewers. 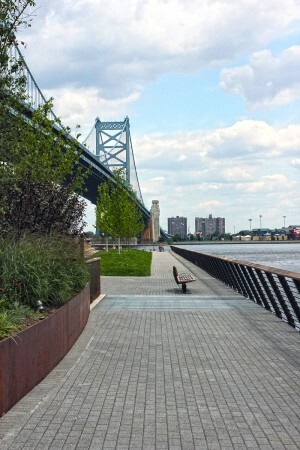 In the time since the stormwater system was built, modern development has blanketed the region with impervious concrete and pavement. During a heavy rain or snow melt (50-60 times each year), the drainage system overflows, mixing with wastewater and dumping directly into the Delaware and Schuylkill Rivers (from which the WaterWorks draws to provide our taps). In 2009, the city finalized a plan to address the runoff overload, pledging $1.6 billion over the next 20 years. Instead of ripping up the streets to build a huge (and expensive) below-ground holding tank, the EPA approved a strategy of implementing a series of “green” stormwater infrastructure programs. 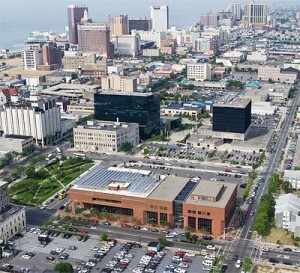 Municipal structures are being retrofitted with green roofs (and businesses and residents are encouraged to follow suit), basketball courts are being repaved with permeable concrete, parking lots are being designed to include vegetated strips and old asphalt lots are being broken up and turned into rain gardens. 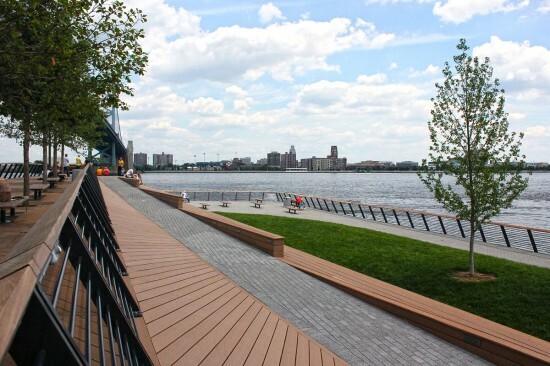 The idea is to turn the city’s surface into a sponge, instead of an impervious barrier. Most of these water-management techniques have been used successfully before, but not on the scale of an entire Northeastern metropolis. 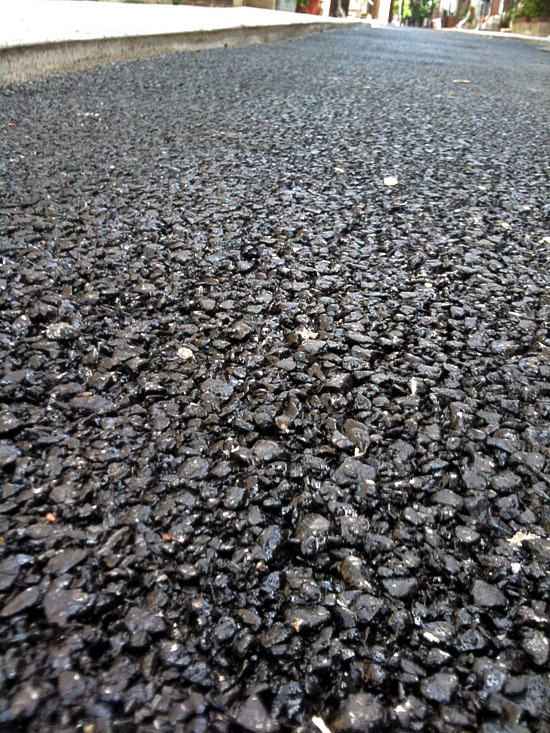 Porous asphalt is much like regular paving material, but made without the finer grains in the mix. This creates a surface with much larger gaps, through which water can seep. 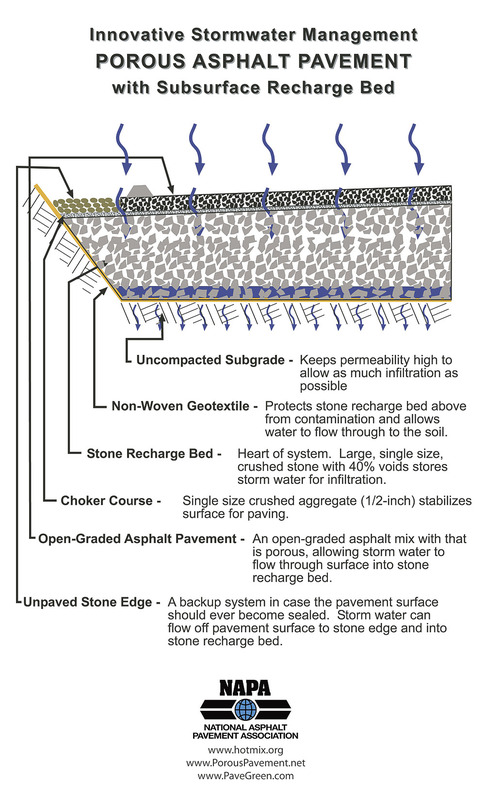 Beneath the blacktop is a layer of stone that acts as a reservoir, slowing down the seeping liquid even more. 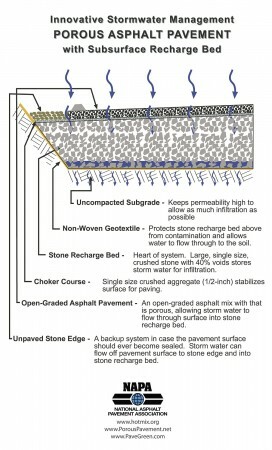 The street surface is still relatively smooth (smooth enough to meet ADA requirements), and because it has room to expand and contract, is much less likely to form potholes. Although a seemingly winning idea, the BigBelly©* smart solar trash compactors that dot Center City Philadelphia have caused their share of controversy. People were not happy with having to touch dirty handles in order to throw something away. A City Controller report leveled accusations that the BigBelly contract was given without a fair bid—causing the city to pay more than they may have had to—and that maintenance costs were much higher than expected. 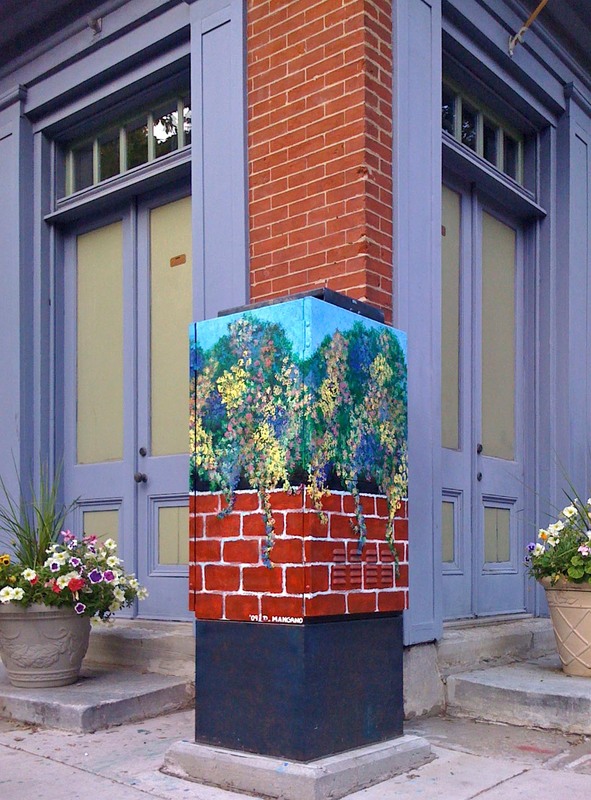 Count on Mural Arts, Philadelphia’s best warrior against blight, to save the day! Or at least, to bring back a positive spin. Several students in the Big Picture program worked with artists Thom Lessner and Ben Woodward around the idea of “garbage monsters” to create original artwork, which the printmakers then synthesized into wrappable designs. Art installations will cover 50 compactors or compactor/recycling pairs, all of them along Headhouse Square and up South Street from 2nd to 10th Street. On the first day, the project completed three wrappings, and plans are to finish all of them by mid-November. The receptacles are first well-cleaned, and then printed vinyl carefully applied. The art is expected to last at least a year. This project is an extension of the popular Design in Motion: Recycling Truck project, which saw fanciful designs applied to Philadelphia’s recycling trucks. Hopefully, the Litter Critters will see the same success, and will be co-opted by other neighborhoods. And perhaps we might extend the project further to cover the ugly big brown corner signal boxes? *Please assume the copyright symbol follows each mention of this brand name. We don’t feel like littering our post with it. Smooth slabs of flecked marble. Slate gray walls. Arched ceilings. Ax murderers? The recently opened Dostoevsky Station in the Moscow subway has all of that, and more. 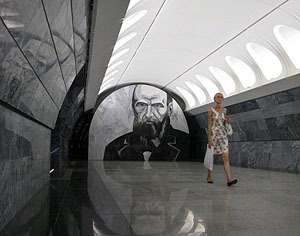 One of a series of metro stations named after Russian literary heroes, Dostoevskaya features murals that depict scenes from his famous novels such as Brothers Karamazov, The Idiot and Crime and Punishment, as well as a stern portrait of Fyodor himself. 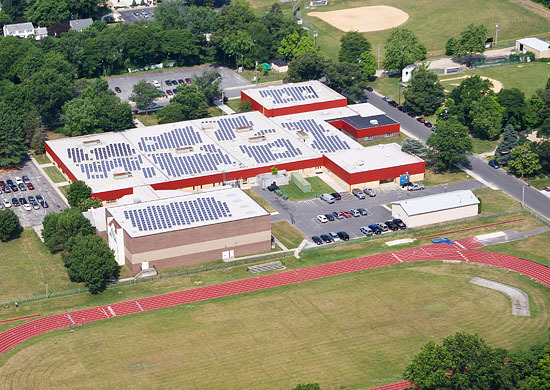 We recently had the opportunity to do an aerial photo shoot for Vanguard Energy Partners, a New Jersey-based company that manufactures and installs solar electric systems. A home, a farm, a high school, a municipal EMS building, a bank, a shopping mall, a courthouse, a warehouse and even a federal prison. We also saw several other examples along the way. 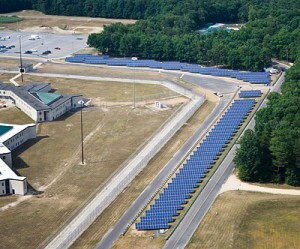 Photo-voltaic cells are arranged in solar panels that live on rooftops and are connected to the structure’s main electrical panel. Energy is produced when the sun shines down and is converted into alternating current that is fed into the building’s power supply. Solar panels are not new, but installation and use of these systems is on the rise around the world. Germany leads the pack in wattage produced per capita, which is three times the number for Japan, and more than 15 times the per capita amount in the US. Not only is this the most environmentally friendly way to produce electricity for a home or facility, it’s also cost-effective, greatly reducing electric bills. You can even earn rebates on utility bills when any excess energy is produced — it’s sent back out into the main power grid. 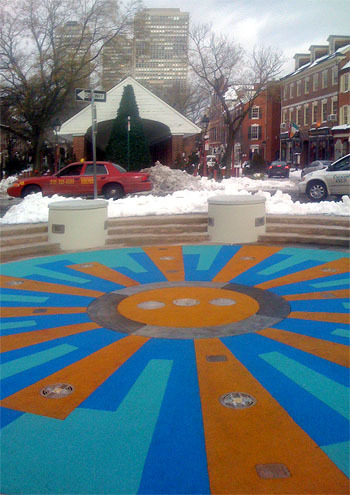 Federal and state tax credits help offset the initial cost of installation. Seeing these installations all over the place — on all kinds of structures — was refreshing. All of our energy comes originally from the sun, but solar panels allow us to capture it without a lot of polluting and wasteful intermediary steps. Instead of sun → plants → dinosaurs → petroleum → steam → electricity. Above ground, the people live. Below, the cars. The parking robots are coming. Over the past decade, automated parking systems have become quite common in Europe and Asia, where land use constraints are tighter and many areas more congested than the US. 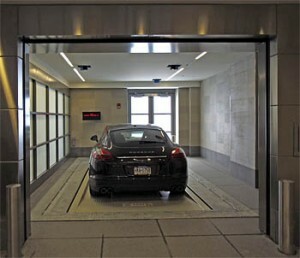 Automated parking systems can fit up to 20 cars in the footprint that would traditionally house just four. The number of automobiles produced worldwide may actually be on the decline, but we still crank out over 50 million cars each year. Along with the new trend of “bright flight“, American city developers are feeling the capacity crunch, and auto-auto-lots have begun to appear here as well. Although the first of these facilities — built in Hoboken, NJ in 2006 — was plagued by technical glitches and failures (little things, like dropping an unoccupied Cadillac 6 stories…), the technology has advanced quite a bit since then. Working automated lots are in use in Washington DC and New York City, with more planned for other locations. The fourth automated lot in the country — and the first in Philadelphia — has just opened below ground at 1706 Rittenhouse Square Street. 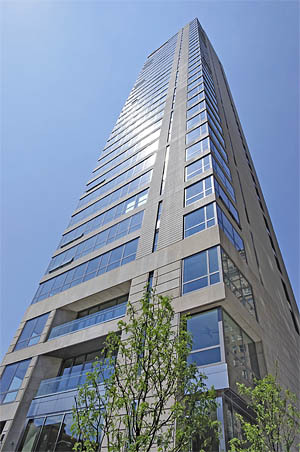 The compact, underground lot was crucial in getting the luxury, single-residence-per-floor tower approved and built. The small space, just off of Rittenhouse Square behind the Curtis Institute, had been a surface parking lot owned by Philly-based Parkway Corporation for the past several decades. Parkway teamed with Scannapieco Development Corp and asked Cope Linder Architects to come up with a design that would maximize potential of the parcel. The group’s plan was to fit into the historic neighborhood and keep the tower’s footprint relatively small and set-back by incorporating an underground automated garage. 1706 Rittenhouse’s is the most advanced model on the market, designed by German manufacturer Wohr, who have been building automated garages since the 1970s. “It’s run by incredibly sophisticated software,” said Cope Linder partner David Ertz. The parking lot, like the rest of the tower’s design, is understated. The limestone facade that echos design cues of the older buildings on the small alleyway transitions to concrete on the upper floors, and is so minimal it’s in danger of being boring. 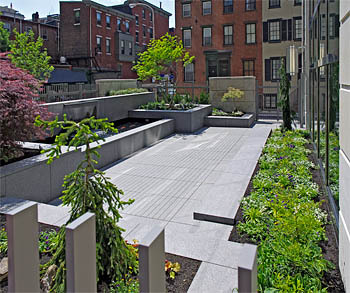 But the 360-degree windows on each level and the attractive curbside koi pond and garden make up for it. And they certainly look better than a gaggle of automobiles, sunning on the surface. Is There a Café in the House? Center City Philadelphia is in the midst of an urban renaissance. For the first time since the 1950’s the census will show an increase in the city’s population. The city’s restaurant scene is exploding with tons of new spots, including our new Iron Chef star Jose Garces’ & Philly pioneer Stephen Starr’s recent openings with more on the way. Because of this, several neighborhoods are leaning on the restaurant boom: Cafe Cret opened on the Ben Franklin Parkway, and Franklin Square enjoyed great success bringing in SquareBurger. South Street Headhouse District might be next. A multi-step improvement plan is in the works. Philly Councilman Frank DiCicco secured money for the already-completed first phase. This past week saw the dedication of a new fountain at 2nd & Lombard. The fountain, which had been in disrepair, now boasts a child-friendly, rubberized basin, colorful LED lighting and more seating. New, programmable water jets feature an ananemometer to measure wind speed and automatically adjust the height of the spray. On one side of the fountain sit the Headhouse Shambles — home to one of Philly’s biggest & best farmers’ markets. On the other currently sits a mishmosh of parking spaces & asphalt. Cope Linder Architects, who provided the design for Phase 1, have ready a preliminary design for this area which would reclaim much of the space from cars. 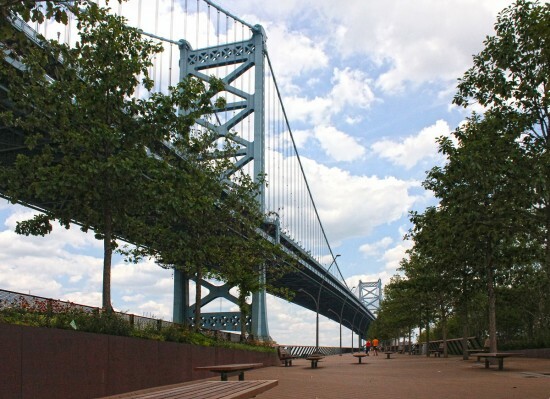 It involves an expanded, landscaped pedestrian walkway from the fountain up to the South Street end of the block, where a pavilion with a café will be built. Such a café might bring not only a steady stream of revenue from concession sales, but also encourage more pedestrian traffic for neighboring establishments. Barry Essinger of Cope Linder even brought up the possibility of closing off the whole street on weekends or holidays, creating a vibrant. car-free mall like those in Buenos Aires or the new Times Square. South Street is already morphing into a much nicer, more upscale tourist destination. This redevelopment would be a welcome bridge from South to historic Society Hill, and even all the way to Independence Mall and Old City. Because this logo needs serious help. Or really, it needs to be put out of its misery. The idea of a 3-1-1 non-emergency call center was pioneered in Baltimore in 1996. Chicago took it a step further in 1999. New York City’s is the largest, and it has been quite successful since starting up in 2003. 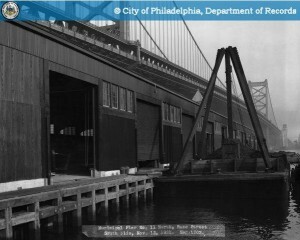 Philly’s fledgling project, which was launched Dec 31, 2008, has been received with mixed results. The program is without a doubt a step in the right direction. Philly311 is on twitter, is set to receive their millionth call, and even monitors the neighborhood citizens’ reporting site SeeClickFix. However, in August the hours were cut back from 24/7 to business hours only. Public perception will play a large role in the future growth and funding of the program. Design is key in this regard. This logo does not help. It is overly complex. It looks like many other company logos, without really being as nice as any I can think of. It is not an easily recognizable shape. And mostly, this logo does not convey easy access to information and help. Much the opposite: the unbalanced colors and shapes suggest a frenzied, harried, mess. NYC even has a whole set of different logos and posters available for download based on their clear, straightforward logo. Everything around us comes from nature. Computers, toasters, steel mills, polyester, even superconducting super colliders, all “natural” in origin. Technology is nothing more than a human byproduct. However, most of our creations are mal-adapted. Unlike the byproducts of all other living beings, most things we’ve designed are not degradable, not reusable, not able to change with the environment or be reabsorbed by it. If we can change this, we can better secure the future of our society, our species and our planet. Can borrow from the way life has been designing for thousands and thousands of years and tangibly apply these lessons to our modern age? This office and retail complex was designed to be ventilated and cooled by entirely natural means, and was one of the first to do so. By using passive cooling, the building consumes around 10% of the energy needed by a similar conventional structure. For inspiration, architect Mick Pearce and his engineers looked to the locally common termite mounds, which are built to catch any breeze and pull cool air in from the earth while sun-warmed air vents out through flues on the top and sides. Another structure borrowing this technique is the visually notable Swiss Re headquarters in London. Moths rely on light sources to communicate and find food and mates. Their eyes, unlike most other animal species, do not glint in the night, which would distract from important light sources (such as your porch lamp…). Moth eyes are anti-reflective. This is achieved with a surface covered with many micro-cone-shaped protuberances, which break up the light and stop it from bouncing back uniformly. MacDermid Autotype has reproduced this type of patterned surface and developed non-toxic, non-reflective films that can be used industrially. When used to coat solar panels, for example, the non-reflective films will absorb much more energy from each ray of sun that hits. The easily-degradable anti-glare films are also used on computer and cell phone screens. Almost half of the materials in our landfills end up there because of glue. For example, a simple chair of wood, metal and fabric is glued together so strongly that the parts simply cannot be separated in a reusable way. Most industrial adhesive is also toxic. However, geckos and many insects walk on walls, and they don’t use suction to defy gravity. Instead, their feet are covered with rows of tiny hairs, that utilize molecular attraction to adhere to any surface. Scientists have begun producing tape and adhesives using this technique, resulting in glue-free products that can stick to dusty surfaces better, can be washed with soap and water, and can be reused multiple times. 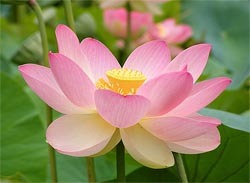 Lotus flowers grow up through the muck of ponds and swamps and bloom into gorgeous, smooth, colorful flowers. The molecular structure of their petals makes it so that water not only rolls off, but carries with it any surface dirt. Companies like Sto Worldwide have mimicked these hydrophobic qualities, and produce exterior paint that is not only water-tight, but essentially self-cleaning, minimizing the need for detergents or for repainting at all. We need to keep stimulating this kind of innovation! I’ll end with the same mantra she did, good advice for anyone, no matter what discipline or field. Last December the Philadelphia Streets Dept. ripped up the sidewalk corners in much of the Wash West/Society Hill area, one block at a time. New signal boxes were erected and cast into the concrete, in anticipation of an (ongoing?) $12 million project to deploy digitized traffic signals throughout the city. Because of a Federal DHS mandate to include future surveillance equipment along with the lighting equipment, the new signal boxes are huge, probably 3-4 times the size of the previous, pole-mounted ones. As the Inquirer’s Inga Saffron points out with her usual acumen, these empty boxes look like huge brown refrigerators, and are an urban design nightmare in our neighborhoods of rowhouses. On her blog she highlighted a few of the more egregiously placed metal monoliths, and noted that the flat sides were an empty slate almost begging for graffiti. A prime example was this one, smack up against the historic house owned by Marjorie Amrom. It appears that Amrom’s gone and had an artist paint a very attractive and colorful trompe l’oeil, or mini mural, all over the offending box. Can we get the Mural Arts Program to commission a project to paint the rest? I still think it’s worth a try.